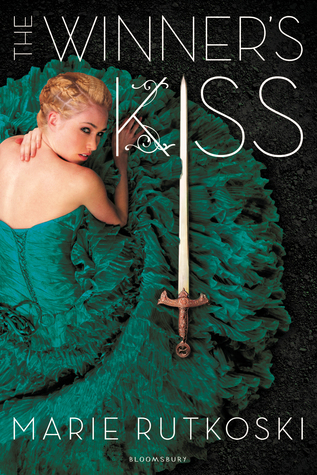 The Review: The Winner’s Kiss is the fabulous end to the The Winner's Trilogy where we have seen a Romeo and Juliet-esque story about two young adults from two sides of a war come together to unite the realms for good. Kestrel is broken, after a failed escape attempt leaves her scarred, she is living to work and for the blessed medicine her captors give her but then someone rescues her, someone who thinks they have failed her but Kestrel is lost and doesn’t remember. When she is taken to safety, she finds her battle is just beginning; she must battle for her sanity, to remember what happened, who her rescuer is and just what side of the fence she sits. Can they ever really live free? It all ends here! So, this series got off to a bumpy start for me and I wasn’t a fan of the first book but I’m glad I stuck with it because it built up into something amazing and something that will definitely stay with me. This book had a very metamorphosis feel to it, especially for the characters of Kestrel and Arin who have gone through so many changes. In this Kestrel is broken, it was really sad to see her like this considering she was so ‘together’ throughout the first book and forever the strategist. It was like Kestrel had to be remade after her stay in prison, she learned many a lesson after the betrayal that sent her there and with what she endured. Reading of her going through withdrawal was awful, she was so weak and pathetic whilst not knowing who had rescued her. I always routed for Kestrel and Arin but I didn’t totally get the love until he did what he did for her, his loyalty when he realised what had happened, his determination to get her back above all else – even a war! – was so admirable. He had his work cut out for him but he was steadfast in everything, including his love and understanding for Kestrel. They both had to get to know each other again, even though the bond was there, they were different because of the things they had each endured and the burden that was on them, plus they had to fall in love again with that knowledge. For all the story was all Kestrel and Arin, I have to say that I loved the secondary characters too especially the Prince Roshar, he brought some great comedic moments to a very harsh plot. Speaking of the plot, the storyline was fab! The first part of the book was focussed on the realisation that Kestrel needed saving and I loved that it was Arin who did it, it spoke of their connection that he knew something was wrong. Then we had Kestrel’s recovery which was very sad but I sat reading with the hope that she would realise who Arin was to her and that she would find her fight again. The change to all of the characters was very satisfying, it was like watching someone grow up and become exactly who you thought they would be. Whilst that was happening, Arin popped in and out of the war giving us an insight into what was happening on that front and injecting quite a bit of action into the story. I love a story where the underdog triumphs over the oppressor and the series had definitely been heading toward a final countdown but what surprised me was the way it was done with not one big battle but a series of battles. I love seeing things come to fruition so the battles were great and I thought it was believable what they had to do and the amount of effort it took to get their foothold. Kestrel really came into her own, her war strategy was amazing – that girl could outthink anyone and could have practically ended that war alone! The battles were awesome, lots of action and the planning in them was great when put into action and some times, very brutal. Thank you to Bloomsbury Children's for giving me the opportunity to review this book in exchange for an honest review. Excerpt from The Winner's Kiss. Arin told his ship’s captain to sidle up along the largest of the Dacran sloops. After giving his captain orders to dock and find Arin’s cousin in the city, Arin boarded the sloop. He approached the commander of the eastern fleet: Xash,a lean man with an unusually high-bridged nose and brown skin gleaming in the late spring sun.